April 5, 1975-Chiang Kai-Shek dies at the age of 87 in Taipei, Taiwan from the effects of renal failure enhanced by cardiac malfunction. His death marks the end of the life of one of the most important figures in the history of modern-day China and the 20th century. As leader of the Kuomintang Nationalist Party, he oversaw efforts to resist the Japanese occupation of China and the efforts of the Chinese Communist Party, led by a young Mao Tse-Tung, to seize control of the Chinese government. Mao finally succeeded, formally declaring the People’s Republic of China on October 1, 1949. In the years that followed, Chiang’s role in the history of China was often diminished and overshadowed by Mao’s ‘Great Leap Forward’, the controversial plan that brought China to the brink of disaster. In recent years, Chinese society has seen a surge in freedom movements and the efforts the youths of China to bring change to a system in place for decades. And as the country continues to see itself transformed as new ideas are presented, many may reflect back in time to a period in which a nationalist was fighting to bring democracy and avoid a Communist empire. Emily Hahn presents to us this biography of the late leader which follows his life from the small village of Chikow up until his exile to Taiwan following the push forward into mainland China by Mao’s Chinese Communist Party. Known as the Generalissimo, the rise and fall of the KMT marked a tragic time in Chinese history in which the nation was caught in a battle between several nations to control the future of China. His decisions and actions were often questioned and even his loyalty came under scrutiny by officials in the United States government. 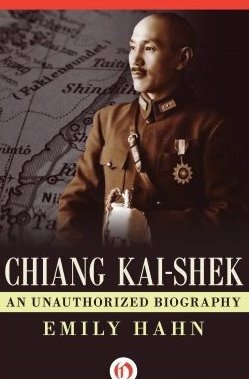 However, this is the real Chiang Kai-Shek, the good, the bad and even the mysterious. A complex figure as all world leaders are, there is no single adjective to accurate describe the late leader. However, Hahn’s account is an informative and valuable look into his life and the many trials and tribulations that afflicted the legendary figure. The relationship between the Generalissimo and his foes and allies in the U.S. is a case study in the controversial U.S. foreign policy prior to, during and following the second World War. Hahn’s account also sheds light on the roots of the Cold War that eventually developed between the United States and Soviet Union. For a good read on Chiang Kai-Shek, the Chinese Communist Party and the alignment and eventual disconnect between America and Russia, this is a good place to start. Posted on May 20, 2016, in Biographies and tagged Chiang Kai-Shek. Bookmark the permalink. Leave a comment.